Search queries… We had them in the Acquisio platform, then we didn’t, now they’re back and better than ever! Historically when someone would click through an ad to the landing page, the search engine passed a referrer ID for that action, including the search query used to generate that ad. Webmasters (and Acquisio) could capture that referrer string and its search query. Since many people searching were also logged into their Google accounts, when the referrer ID was provided, it made someone personally identifiable and raised serious concerns around user privacy. Search queries were suddenly no longer available from Google and were part of the Acquisio platform no more. However Microsoft didn’t have the same issues, so search queries have been and still are available for Bing campaigns inside the Acquisio platform. 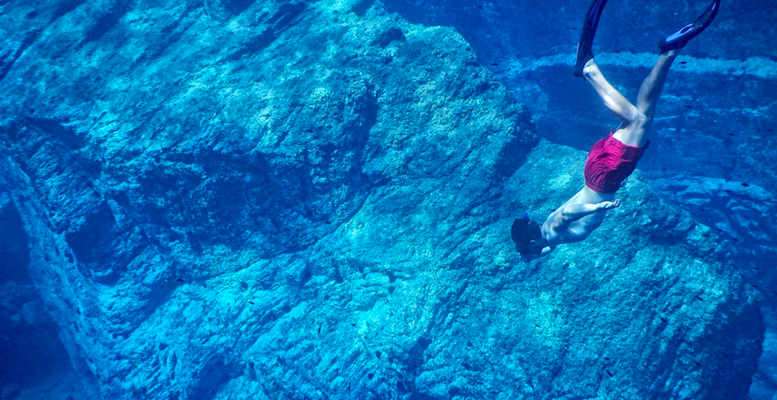 Today we’re taking a deep dive on what search queries look like inside the Acquisio platform now that they’re back, how they work and what users can do with them. What Does the Search Query Tab Include? The return of search queries means that users can instantly view Google search query data by simply clicking on the tab in the Workbench. No additional setup is required. Since Bing Ads still pass the search query data to the host website via the referrer ID, you will need to setup the Acquisio Tracker if you want to capture the Bing search query data as well. When enabled, the Tracker will automatically populate the Search Query tab with Bing data. The Search Query tab has a ton of great information, most importantly being the search query itself. The tab will also show you the campaign and ad group for the keyword triggered and more. The image below shows only some of the functionality available in this tab of the platform. The platform search query (SQ) tab also includes data columns not shown below like SQ Clicks, SQ Estimated Cost, SQ Revenue, SQ Gross Profit, SQ Last Click Conversion, SQ Accounts and SQ Conversion Rate. Knowing which keyword was triggered by which search query is an epic tool for keyword discovery. Having data on the keyword is useful for informed keyword decision making. 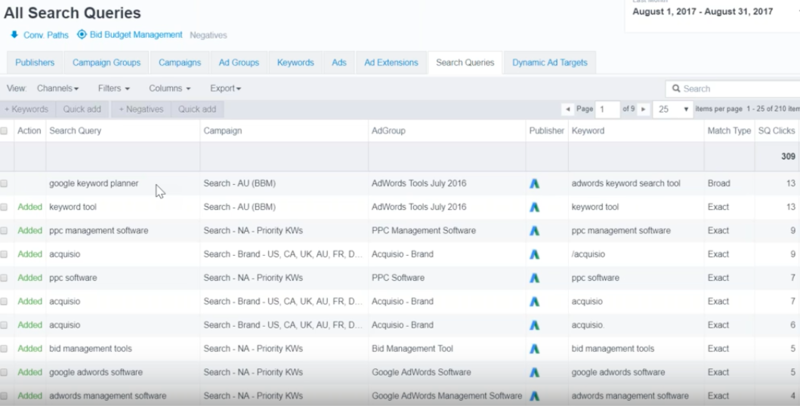 Using the “Quick Add” button, users can easily add the keyword attached to a search query, as seen in the image above, as an exact match keyword to the same campaign, same publisher account and same ad group that the search query connected to. But what if you wanted to add a negative keyword at the campaign level and not at the ad group level? We support that too. Just click on negatives, next to the Quick Add button, then in the ad group column, then specify that it’s at the campaign level, instead of selecting an ad group. Why Would You Add Search Query Keywords? When you Quick Add a keyword from search queries, it’s added as exact match which is cheaper than broad match, so that’s one good reason! Not to mention there is less competition when using exact match. In turn this exercise can improve your quality score, which will mean more ad views and lower CPCs! Search queries have a lot to offer. If the keyword already exists in your account as exact match, the search queries tab will show the word “Added” in green to the left of the search query, as seen in the image above in the previous section. What Can You Do with Search Query Keywords? Aside from the ability to identify search queries, quick add them to accounts, and gather data around them, there are a few powerful things you can do in the Acquisio platform. Changing the match type is another user-friendly feature in the search queries tab . If for example you see some new keyword opportunities coming in from Bing and you want to add them, but not necessarily as exact match, users can just change them to phrase match by checking them off and clicking the keywords button from the main search queries menu. Users are then taken to the window shown below where additional modifications can be made to these keywords. For example users may see a misspelled keyword come through, like “Facebook Menager” instead of “Facebook Manager.” In this case users can simply edit the spelling and add it as phrase match, picking up any additional misspellings along the way. You could even pause keywords here, by changing the keyword status from “Active” to “Paused” in the Status column to the right, seen above. Since the keywords came in through Bing in the example above, users may want to add these to their AdWords accounts as well. One of the best parts of the search query tab is the ability to duplicate keywords across publisher accounts, as you’re adding them to accounts from search queries. Using the blue duplicate plus signs, as shown on the right-hand side of the screenshot above, users can copy new keywords from one publisher campaign to another with the click of a button! Anyone familiar with our Bing cloner will be happy to see the same functionality built into the search queries feature. You could also add the same keyword to different accounts from the same interface as well, shown in the image below. This feature is especially useful for anyone whose accounts are broken down regionally, but largely the same otherwise. As you can see search query data is exceptionally functional within the Acquisio platform for the sole purpose of making our clients lives easier – you’re welcome! Campaign managers should be checking in on their search query data and the keywords opportunities under this tab at least once per month. Note: If you’re using our Acquisio Turing bid and budget management, speak to your account manager about the best way to structure your account to get the most out of search queries! All screenshots by Gerry Routledge. Taken September 2017 from Acquisio. Gerry brings personality, humor and smarts to the tech team as the Senior Sales Engineer at Acquisio.